While Jeffery might not have been born in Myrtle Beach, he's spent most of his life here; he even picked up a BA in Communication and an MA in teaching from our own Coastal Carolina University. 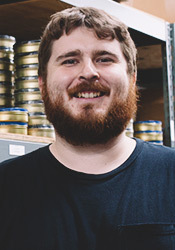 He applies that love for language to our Merchandizing department as one of our talented Copywriters, responsible for writing and editing product copy for all the pipes, tobaccos, and accessories on the site. And like a lot of us around here, when he's not at work, you'll find him hitting concerts, the recording studio, or hunting down vinyl at the thrift store.